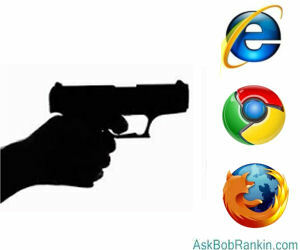 What is Web Browser Hijacking? If your Internet Explorer, Chrome or Firefox browser suddenly behaves in unexpected or undesirable ways, it may have been hijacked. Browser hijacking is usually an attack by malicious software that changes your Web browser's settings. Some users who have been hijacked report popups or having searches redirected to pages for online casinos, weight loss products and even p**n sites. In other cases, the user's preferred search engine is changed without notice. Here are some symptoms that indicate you've been hijacked, and how to fix it. How does browser hijacking happen? In some cases, the hijacking software is something you downloaded and installed, thinking it was beneficial. My article on Fake Anti-Virus and Celebrity Scams has details about how some people are being tricked into installing malware. Sometimes it's a result of unpatched software components that have been exploited by hackers to initiate a "drive-by download." See my related article about Drive-By Download Dangers to learn how to protect against those. But if you look carefully, there's often a pre-checked box, asking if you want to install some other unrelated program or toolbar. These are usually more annoying than harmful, but sometimes are hard to remove. Software such as Conduit and Babylon toolbar fall into this category. Even if there's no malware, per se, you're still better off getting rid of these unwanted browser pests. My article Downloading? Watch Out For These Danger Signs explains why previously trustworthy sites such as CNET's Download.com and Tucows are now landmines to be avoided. If you believe your browser has been hijacked, shut down your browser immediately. If you cannot close the browser in the usual way, press Ctrl-Shift-Esc to access Windows Task Manager, highlight your browser's file name in the Processes column (iexplore.exe, firefox.exe, chrome.exe) and click "end process" to close the browser. Hijackers are one reason it is vital to have real-time anti-malware defenses in place at all times. If you're already running internet security software, obviously it didn't protect you from this particular menace. If the problem happened recently, System Restore may "undo" the problem and get you back to normal. Restart your computer, open your web browser and put things back in order. Review and reset your home page, security settings, privacy settings, etc. Delete any unwanted favorites/bookmarks. Review the list of add-ons and uninstall any that look unfamiliar. On Vista or Windows 7 you may need to open your text editor by right-clicking, then select "Run as Administrator". Make sure the HOSTS file includes ONLY comments (lines that start with "#"). The only exceptions would be "127.0.0.1 localhost" and any other lines that you know you added yourself. Delete unwanted entries and save the HOSTS file. To avoid browser hijacking, use real-time anti-malware defenses; don't give unknown websites permission to install software, toolbars, or ActiveX controls; and keep your browser's security settings on medium or high level. Most recent comments on "Help, My Browser Got Hijacked!" I will never understand why when doing a reset in Internet explorer (Advanced Tab ) that it does not fully reset to factory settings ! On Vista, the Windows Live Essentials 2011 (KB2424419) "Update" installs a Bing Bar as well as Replacing your "Windows Live Toolbar". It offers to replace newer preferences in the place of what you have already selected (Mail, Photo Viewer, etc). Apparently this was first offered ('Published') on 4/5/2012... and I have yet to choose to install it with no ill effects as far as I can tell. One way to prevent unwanted programmes (PUPs) from sliding into an installation is to use the freeware "unchecky" - it automatically warns about such PUPs and recommends unchecking the relevant boxes. Install Unchecky (from unchecky.com) which, in their words, "keeps your checkboxes clear." It works in the background and prevents those annoying toolbars, search engines, etc., from being installed. I've installed it on all my computers and my friends' computers and I'm not getting as many calls to remove unwanted toolbars and search engines as I did before. Unfortunately, most people don't take time to carefully read when installing software and this program seems to take care of unchecking the pre-checked boxes pretty well. I also use Privazer and AdwCleaner which work great. About a year ago, my browsers were hijacked and the default search set to AVG's search bar. Yes, that's right, the supposedly wonderful AV/security company. It was a hidden install included with an update of a proprietary software (FixCleaner). I always watch for the "extras" offered during downloads; this was an update, so it had no series of "Next" pages. I proved this by doing a system restore to revert everything and then re-installing the update. Yep, there she went. Needless to say, I repeated the system restore, removed FixCleaner, and blasted off angry emails to both AVG and FixCleaner. No response from either, but I won't ever use anything from either company, ever again. I ran into an especially nasty one. The program erased my system restore files so there was nothing to go back to! I found that adwcleaner, downloaded from bleepingcomputer.com got rid of conduit, which had been plaguing me, resisting all other efforts. Someone I know (not me) did a dumb thing by downloading some "coupon" site software off some pop-up ad. Yep, they got the dreaded Conduit virus. Even after they followed my suggestion of downloading Malwarebytes (which was a chore as conduit apparently tried it's best to block it), doing a 9 hour scan (including rootkits) and locking conduit away, it screwed things up so badly they could not access the internet at all, much less even run other basic software. In the end the local Geek Squad had to operate. I hope the "inferno" has a special circle just for those who foist this malware upon us. @ Bob Kamino; Microsoft updates are particularly nasty as they destroy system restore points since Windows XP. (Have been enduring Windows 7 for 4 years or so). It's not a good idea to depend on system restore. DOZENS of times I've gone there to turn back the system and found NO restore points. After MS updates. Learn to use a good backup program and use it. I backup about every 3 months or so. And Adwcleaner will find and remove crap that MBAM or Spybot won't find. Wait a minute ... I keep seeing, good suggestions for eliminating nasty Malwares, Trojan Horses, Worms and Viruses. Lately, it really does seem that the biggest problems we run into ... Are the Malware/Foistware that comes with Downloads and "Nasty" Websites!!! However, I keep reading a re-occurring theme ... “Let’s blame the Anti-Virus or Malware programs, for this issue.” Please, remember ... The designers of these “nasties”, know fully how to "by-pass" the popular programs, and that is one of the first things, they do. When, I got the Conduit "drive by" with a download from CNET ... The first thing, I did try to use was Malwarebytes. I even had the Pro version ... It froze at the same spot, every time I tried to scan my PC. Talk about frustrated, I was really upset. Then, I started looking on the Internet, to see what the solution was, to the Conduit issue. ADW Cleaner was mentioned, on several different forums and articles. I first tried using Chameleon, from Malwarebytes. The "designers" did their homework, is all I can say ... Using Chameleon, I got the freezing at the same point and no advancement. Then, I decided to use ADW Cleaner. Finally, I was able to use my own tools, to continue with the removal of Conduit and for me, Sweet Packs! My Chameleon was the first to work, with a complete scan, then I used my Malwarebytes Pro to scan, again. However, with all of that ... I STILL had Conduit and Sweet Packs!!! I went back to the Internet, for more reading. One of the forum moderators, stated they had a miserable time, getting rid of this mess. They had to go into the Registry, to search for both Conduit and Sweet Packs, both were hidden deep within. Finally, I had my solution, but, it did take me over all, more than a week to get my Conduit issue resolved. Then, my daughter's PC got the same issue and she lives out in California, while I am in Georgia. Thank goodness for Team Viewer ... I was able to "clean up" her PC, because I knew what to do, by then. There have been many times when I have been called by a friend of family member and they tell me they have a virus because their browser is acting "weird". I go over there and discover that they have several browser toolbars and when asked they usually say they had recently installed new software. When I ask how they installed it they say "I just kept clicking 'next' until it was finished" at which time I am about ready to strangle them. I tell them why they have so many toolbars and mostly they look shocked when I let them know that clicking "next-next-next" is the worst thing to do when installing a new program. After a long lecture and an explanation on how to install programs I get their PC back into working order and do a little maintenance too (update programs, run CCleaner, Defrag, etc.) and they are usually amazed at how well their PC runs. I never ceases to amaze me how many people do this (AND STILL DO IT!). Word has spread around my neighborhood that I can "fix" a PC fairly quickly and I just say 'No, I just fixed a simple mistake somebody made'. Keep up the good work, Bob, and keep spreading the word with your great tutorials. I just wanted to say thank you so much for your emails and excellent advice. Somehow that blasted Conduit got ahold of my laptop. It was there for months and I had no idea what to do. I was very happy to see you address this issue. I did exactly what you suggested....and voila.....all is back to normal. So, thank you so much. Just go to your "Programs & Features" in the Control Panel, and search for "Search Protect" (Developer's name is Conduit), and uninstall it ;), check the date of installation of your BING and anything else that was installed at the same time, that's your culprit! It is a stubborn program, if it doesn't want to uninstall or takes foreverrrrrrr, skip it and go find a program: Revo Uninstaller (free version) that will do it in minutes. As a retired Senior Help Desk Analyst I know better than to download programs, etc., without doing my homework first and even I get burned once in a while. Afterwards, I closed all of my browser windows and rebooted my PC only to find out that my browser was hijacked by IStart123.com and several unwanted programs were installed. I opened IOBit uninstaller and began removing the three rogue programs. It took a while but eventually I managed to wiped them out. I opened up Chrome settings and changed the homepages back to my original settings but when I closed and restarted Chrome, IStart123.com was still my homepage. I discovered this site while researching removal of the IStart123 homepage issue and I am working on getting rid of it as I make these comments. This morning I ran Malwarebytes and eliminated two malware items. I am concerned that the installation I cancelled did not stop and decided that the prudent thing to do is put this information online so that other users will read it and avoid theses sites. I am relatively satisfied with Malwarebytes and Microsoft Security Essentials but the jury is still out on Advance System Care 7. I purchased the Pro version and it turns out that there are several programs that I thought were included but actually turn out to be add-ons that must be purchased separately. That is another issue that is on my list of software to avoid. The information provided when I purchased the application was misleading, ergo, the trust factor is up in the air. I bought this pc used and I have found a lot of p**n on it. can all visited sites be permanetly delited How can this be done. I have tried many of the programs on the net that says FREE but after the scan they request $30 or $40 in order to remove all the problestms. I have been afraid to send the money because I don't know these peopleevery time I open . Are there any FREE programs that will help me stop these search engines from popping up every time I go online. The Chrome browser redirected me to piesearch.com that was much like a web search a few days ago. A page claimed that the piesearch is browser hijacker and gave me a step by step removal guide. The tutorial/a> showed me how to reset browser settings, DNS and hosts file that you mentioned above as well. You are right. Resetting the DNS data can hosts file may remove browser redirect and adware from computers. But to do that, you need to find out some potentially hidden rogue software and remove it from the system. It is reported that browser hijacker and adware often come bundled with rogue programs. You can read this tutorial (http://blog.doofix.com/get-rid-of-piesearch-com-fix-browser-redirect/) that takes pirsearch.com for example to learn more details. 1. In Windows Explorer right click "Computer" and then select "Properties". Then select "Computer Protection" (or whatever it's called in english), located on the left side. 2. There's a button to restore your system settings to a previous date. Pick a date that you feel you can live with. Going back too far and you lose a lot of settings. 3. After the computer reboots and you run Chrome, chances are that the homepage still shows up with Trovigo. The system restore will have done its job if you restored back to a date prior to the virus being added but even after the restore, Chrome will retain the setting to Trovigo because Chrome by default will store your settings on Google's servers and retrieve them the moment you run Chrome again. To get rid of it in Chrome, go to Chrome's Settings screen and under "On startup", click on the link "Set pages" next to "Open a specific page or set of pages. ", then change the startup page from Trovigo to your own start page. yeah, or just install reasoncoresecurity.com, or malwarebytes, or other cheaper software. I dont think that unexperienced users will be very excited to try and remove malware manually.